Confusional arousals are a type of parasomnia. This sleep disorder has been dubbed “sleep drunkenness” and is also known as "excessive sleep inertia". They can cause you to act in confused or strange ways upon awakening. Basically, it’s when a sleeping person appears to wake up but their behavior can indicate otherwise. Typically occurring upon awakening from a deep slow wave sleep or a non-rapid eye movement (NREM) sleep. 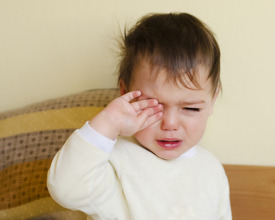 Since NREM sleep is more prevalent in children than adults, confusion arousals are most commonly seen in toddlers and early age school children. These arousals can make consoling and waking children difficult. The children are awake enough to act out normal behaviors but asleep enough to not be conscious of them. Unfortunately, there is not much you can do to “treat” this type of parasomnia. The majority of children will outgrow them. If these symptoms are persistent and your child is over 6 years of age it is suggested to consult your doctor to make sure there are not any larger underlying issues. Recent studies have shown that patients with other sleeping disorders, such as sleep apnea, were also more likely to suffer. If you feel you are suffering from excessive sleep inertia but do not have any of the sleep risk factors mentioned above, you could be suffering from a possible underlying medical or psychiatric disorder. It is important to address and treat arousal disorders for multiple reasons. One is this disorder can be embarrassing for the sufferer, especially when the disorder happens away from the comfort of their home. Secondly, the sufferer could accidently injure themselves or others during an arousal episode. Bed Partners, family members, and roommates may suffer the loss of sleep as a result of your arousals. It is just as important not to wake an adult during a confusional arousal as it is with children. Make the environment safe for the sufferer upon awakening and nothing harmful is nearby. Treating any other underlying sleep disorders. With sleep apnea, your parasomnia symptoms may decrease or disappear completely with the help of proper CPAP therapy. If you or a loved one believes that confusional arousals are a concern, you may want to schedule a sleep study to help find the cause of the disorder and receive suggested sleep treatment options. If you live in Alaska and a sleep disorder is becoming worrisome, contact The Alaska Sleep Clinic to receive a free 10-minute phone consultation with a sleep educator by clicking the link below.